Wiring mods made easy with four different sounds at tips of your fingers. This is the arched Les Paul style ring for bridge position in black. The Triple Shot switching mounting ring is amazing for a variety of reasons. You get tons of tonal variety from the four different sounds it gives you (splitting to either coil, series operation, and parallel operation). You are able to easily switch between the various sounds with just the flip of your finger. No more reaching for pushpulls there are two small slider switches at the low E-string edge of the ring for easy access. And, the Triple Shot is incredibly easy to hook up. No more fumbling with pushpull or mini-toggle connections—the Triple Shots color-code labeled solder pads are a snap to solder up. Imagine having coil splits on your 335 without having to pull the harness, and struggle to get the pots back in the right place One ring for each pickup means four sounds per humbucker. The combinations are almost endless.This version is our arched, bridge position Les Paul version in black for guitars that use a traditional Gibson-style mounting. With this version, there are separate neck and bridge models, just like with traditional mounting rings. 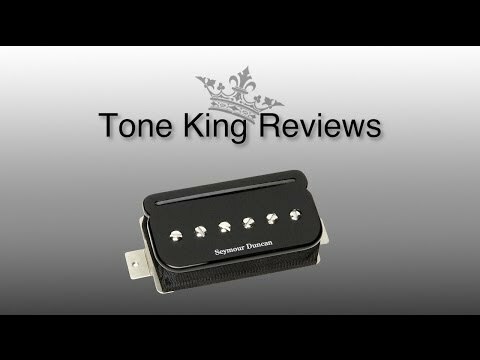 Welcome to the first instalment of Tone King Reviews! My name is Jason Fryer, guitarist for the band River CIty Junction & owner/producer of Tone King Records. Tone King Reviews is a monthly webcast from our recording studio that will feature in depth gear reviews, studio/recording techniques & tutorials for all you fellow musicians out there looking to get into the biz & make your mark. This month we're doing a feature on Seymour Duncan P-Rails Pickups & the Triple Shot Switching System. I first became interested in these pickups because I play a wide range of music styles, but I like playing just my one guitar & wanted a little more versatility from it tone-wise, so I grabbed a set of P-Rails & the mounting rings with the switching system & dropped them into my Gibson ES-339. The installation was a breeze & the pickup rings actually make the install so much easier. I was a little concerned at first because of the very high DC resistance of the pickups in series as I was quite used to playing on vintage style pickups that seldom weigh in over 8K, but I was actually very pleasantly surprised to find that they really don't push the front end of the amp as hard as I would have thought. In fact, I find them to actually have a much wider usable dynamic range & while I had a bit of a readjustment period, I much prefer them now. They sound great live, record really well & are so versatile. All questions, comments & suggestions are welcome, & if you'd like to see/hear a review of something, just drop us a line & we'll do our best to make it happen! Thanks for watching & if you dig it, subscribe!